Will Sony DPT-RP1 Ever Get Improved Software? It’s hard to believe that Sony’s latest 13.3-inch E Ink PDF reader, the Sony DPT-RP1, has been out for over 9 months now. 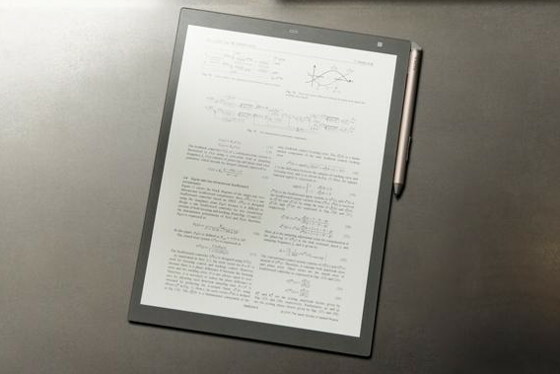 What’s even harder to believe is the fact that Sony still hasn’t issued a single software update to address the lack of common software features on their second-generation digital paper device. Soon after the Sony DPT-RP1 was released, reps for Sony customer support started posting online and in forums about an upcoming software update that would add more features. Nine months later and there’s still no software update to be seen. Last December a Sony employee’s post said a significant update was in the works and it would be announced in early 2018. So far the only thing that has turned up is this description of the update on the Sony Japan website, but it’s unclear from the translation if that’s all the new features or just a few. Only three improvements are described: panning while zoomed-in, go to page, and projecting to a larger display—if that’s all the changes they’ve made in all this time then there will be a lot of disappointed customers. Going by the reviews at Amazon, most people seem to love the hardware on the DPT-RP1, myself included, but it falls short in the software department, being too locked down and restricted, while at the same time leaving out a number of common features, like table of contents support, jump to page, there’s no back button to return to the previous page after hitting a link, there are no bookmarks and no dictionary, no ability to add text notes, and the Sony app is required to transfer documents. CP1 page “Not Found.” I suppose this is for any software upgrade too . . .
Sony have proven time and time again they don’t give a heck about the actual user, they will eventually lose all their market share when anyone big makes an even semi decent attempt at this niche.